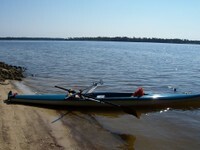 We'd like to Welcome Erich Schloemer of Midwest Rowing to our list of fabulous and enthusiasts Echo Rowing Dealers. Welcome aboard Erich! Division of Mainstay Marine Inc.
Annapolis store is under construction and will be re-opening May 1. 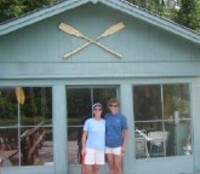 "I learned to row three years ago, just after being laid off from a full-time job, and a few months before my 50th birthday. One of my ex-co-workers had been rowing on the Monterey Bay, here in Northern California, for several years and offered to teach me. I was instantly addicted! Although I thought I’d enjoy the freedom and flexibility of rowing in a single, our rowing club’s sculls were not ideal for a novice on the Bay. I felt as if I was spending all my time balancing and staying dry, instead of moving gracefully through the water, enjoying the scenery and ocean life like I’d imagined. Then, one cold and rainy day in February, the Echo rep visited our area to demo their boats–and I was in love! Not only were the Echos really pretty, but I felt comfortable and safe from the moment I took my first step into the boat. (Yes! You can step into this boat–not just make a calculated plop!) I noticed right away that I wasn’t tipping precariously, even though the current was strong at the docks and the wind was blowing. By then, it was also raining, but I was getting very enthused. I wasn’t willing to leave without a test drive, so I headed for the harbor mouth and out towards the Bay. Our harbor mouth is a tricky place to row, especially during the winter when the current and waves can affect the boat’s movement as fast as one can compensate. That day would not have been appropriate for most rowing sculls, but I felt very secure in the Echo, so I headed straight out to the Bay. It handled the swell beautifully, just bobbing up and down. (I later discovered, under even more challenging conditions, that the Echos love to surf!) I’d finally found the boat that provided both the stability and comfort needed for our open waters, and a few weeks later I was the proud owner of an Islander. Now, almost a year later, I’m just as happy with my boat as the day it arrived. There’s a stability factor in the Echo that makes it especially comfortable for newer rowers, or those with less-than-perfect balance or skill, as well as for various open water conditions. I don’t think of myself as a risk-taker or wild-woman-rower, but I love having a boat that I know is going to stay under me all the time. It bounces along happily in wakes, and I stay much drier than I have in other sculls. The Echo forgives my stroke imperfections by not throwing me into the cold waters of the Monterey Bay, where surfers wear wetsuits all year long. It not only forgives, but also helps me improve my stroke by responding to subtle adjustments. The lack of skeg in the Echo design concerned me at first, though it’s certainly more convenient on landings. 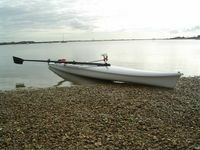 However, as it turns out, rowing with the molded keel just requires a little practice, and it’s a definite asset in heavy swell conditions that tend to push a boat around. I also feel comfortable maneuvering in our tight harbor area where quick turns are needed. The Echos are by far the perfect open water single for me! I never did go back to working full-time. Rowing has become a big part of my life, so I opted for part-time work that allows me to get out and row as often as I wish. I’m not a novice anymore–but my Echo continues to serve me well in all conditions, and its smart design always seems to catch the attention of other rowers in the harbor. 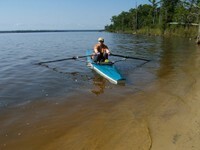 With this boat, I really am moving gracefully through the water, enjoying nature and the company of many new friends!" A note just to let you know that at last the boats have arrived and I love them! I picked them up from the import agent on Friday. They got here without a scratch although the packing crate had taken a bit of a battering at both ends (snaps attached just for your interest). Poor weather has meant I couldn't get on the water until today but enjoyed a great row this morning. Regards and as always thanks for all your help.